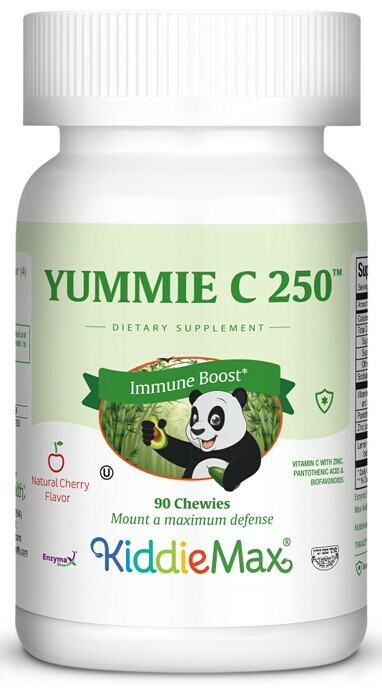 Stop fighting with your children or other picky family members to take their vitamin C. Your health partner at Maxi Health® proudly presents Yummie C 250™. It’s a delicious Vitamin C formula with a natural cherry flavor. More good news...it's not just vitamin C. We have added Vitamin B-5 and Chelated Zinc for even more antioxidant protection. Chew one (1) to four (4) chewies daily or directed. Other Ingredients: Fructose, isomalt, maltodextrin, natural color, gegetable stearine, natural flaovrs, vegetable magnesium stearate, cellulose, Enzymax® (calcium carbonate, bromelain, papain, lipase, amylase, protease, silica), sucralose. TRAACS™ is a registered tradmark of Albion Labs, Inc.